Today continue thoughts and prayers for a peaceful resolution to the oppression in Tibet and for meaningful autonomy for Tibetan people. The Chinese have turned up their aggressive language and continue to blame His Holiness for the violence and protests. Such attacks are painful for anyone who has read even a few paragraphs of writing or ever heard His Holiness speak. He is an epicenter of love and compassion. These words show the depth of distortion, untruth and brutality at the foundation of this Chinese administration. His Holiness the Dalai Lama has responded, “I say to China and the Tibetans — don’t commit violence.” He suggested the Chinese themselves may have had a hand in it to discredit him. “It’s possible some Chinese agents are involved there,” he said. “Sometimes totalitarian regimes are very clever, so it is important to investigate.” He said that “if things become out of control,” his “only option is to completely resign.” This step would not change his status as Dalai Lama; he would resign as leader of the Tibetan government in exile. On the issue of independence, he reiterated that what he is seeking is meaningful autonomy for the Tibetan people. Today is a day of prayer for the people of Tibet and a spiritual petition for an end to suffering there. His Holiness the Dalai Lama has issued a press release which you can read here. The authorities now governing Tibet have used strong means in their press to eliminate Tibetan cultural identity, the Buddhist and nature-loving spiritual practices, traditional beliefs and values. Protests began and China responded immediately. There are reports of as many as 100 deaths. Buddhist monks … peaceful and nonviolent … have been seen as the instigators and have met with violent reactions from the police and Chinese military. Even without this crisis, it is difficult to imagine the Tibetan situation. The occupation began under Mao in 1949 and came to an ugly head in 1959 with a brutal Chinese crackdown on protests against their rule. That was when His Holiness, only 24 years old, was forced to leave his beloved homeland on foot. His life in danger, he was disguised as a Chinese soldier and traveled with his family through the Himalayan Mountains to northern India, where he has lived since then. It causes great pain to think of this man of peace today seeing his countrymen suffering again. His Holiness meditates for hours each day on compassion to help him feel others’ pain more deeply and it must be profoundly sad for him to witness the current crackdown. Today I also read of his threat to step down as leader of the Tibetan government in exile if the protests don’t stop. He simply wants his countrymen to back down in the name of peace. It is a difficult request for him to make but his supreme goal has not changed: He aspires for a nonviolent and peaceful solution. He has proposed autonomy for Tibet, and says it should to become an international sanctuary of nonviolence. While violence affects the well-being of Tibetans, their culture, language and traditions are also gravely threatened and are being replaced with those of the Chinese. It evokes some shame for us Americans, for it recalls the largely European, Caucasion effort to overwhelm, remove and drain of identity the Native Americans who lived here before us. We can do our part by praying or meditating for our brothers and sisters in Tibet, and especially for the Dalai Lama, in whatever spiritual tradition we follow … that they be happy and avoid suffering. There is good … and tepid … news in Fiction-Dailyland as a new week begins. The bad-ish news is that I will have to delay my return to writing the novel for a few weeks. The good news is that I have a challenging new project that will probably stretch my abilities in new ways. I’ll be working on a major effort to renew a prestigious credential for a large organization and my role will be to help with the presentation, to give it a narrative flow and a few flourishes here and there, amongst all the dry documentation. For instance, I will be writing brief features to open chapters of documentation, introductory passages, titles. It is an exciting undertaking and will likely consume much of the next month or more … Fiction Daily will keep you posted on all the riveting details. On Friday I made the short trip to New Bern where I dropped off my audio files for “The Mythical Scroll: Finding Jack Kerouac in New York City” at the public radio studio. I also did an impromptu appeal for contributions for them to use during the spring pledge drive … sometimes I can just go on about nothing at all for minutes at the time … uh, am I doing that now? The difficult thing about these spontaneous stream-of-consciousness pieces for public radio is that they’re never as carefully scripted as my commentaries. For those pieces I write … rehearse … read again … and work on them until they’re perfect. More basketball this weekend and a visit from two delightful friends from Durham! If you’re reading this we are looking forward to your visit … we’d like to wash all the dogs before you come but there are no guarantees. We will have coffee and beverages and will be sure to vacuum!! It’s time for the ACC basketball tournament and I’m embarrassed to say I will be watching the games, back-to-back, until I fall off the couch or stop breathing. Every spring I am mortified by my ability to watch the tube this way and by the end of the NCAA tournament, feel fairly brainwashed by the commercials. Advertising is mind-numbing, brainwashing … no doubt about it. When I lived in Prague, Czech Republic, there was little or no advertising. This was just after the end of Communism and there was no consumer-consumption-advertising machine on the prowl for hearts and minds. When I returned to America after two years, I was a different person, able to focus and concentrate and utterly indifferent to pop culture, materialism and consumer tastes. How the mighty fall, I must say. Today I can hang with the best of the TV watchers … through countless dumb beer ads, phone and car ads, even the fast-food. I see how it infects our thinking, too. How many times have I been sitting in front of the TV when I got a sudden urge for ice cream or chips? Despite the poisonous commercials, there’s nothing like basketball this time of year. At least the commercial breaks are predictable and timed, no more than the regulation time-outs called by coaches or umpires. And at some point, the breaks will serve a purpose … when I need to take one of the dogs outside, feed the cats, fix someone’s bedding, clean up a hairball or fix myself some Lotus Tea. As long as I don’t miss tip-off. That’s why it’s almost unimaginable for me to think about somehow setting aside a few hours a day for creative writing. I have only a few fresh hours in a day when my thinking cuts through to creativity; other times, I’m just transcribing. At the same time, when I have too much time on my hands … nothing happens … instead of still waters, with much life, there is a lifeless pool. And so I find myself tottering to one side or the other much of the time, either too much or too little going on. It’s so easy to do anything but write. This week many projects wrap up and I hope soon to clean up the old files, clear off my desk, dust my office, sit, think and make some progress. My husband said yesterday that he has decided to change his career choice (he’s a photographer) and become a writer. Something about freedom of mind and choices, he said. He would make the announcement today, he hinted. “Yeah, and the money should start coming in immediately,” I said. That’s because he has seen me do just about everything possible to make a living during the 10 years we’ve known each other. When we first met I was both teaching composition … and waiting tables at an Italian restaurant. I’ve been a receptionist, secretary (OK, only for one day; it was a disaster), bartender … even an au pair for a while in Paris. These days I still worry about covering expenses and generally stockpile every extra dollar into a savings account for the lean times I’m always sure are just ahead. As I consider the time and mental space needed to write a novel, it scares me to think that I would have to either scale back my professional projects … or start writing at 5 a.m. each day … which I’ll probably do. I’ll have to cut out all unnecessary Internet time (bye bye London Daily Mail). It’s as if I’ve had this one thing I’ve done since I was about 17 years old, though I couldn’t have put it into words then. Finding income was always a part of my life; I started working at 15 (waitress at Parker’s Barbecue). It’s not that I don’t enjoy hard work; it’s just that there has always been an obsession inside to follow the experiences and make note of them. Back at work today after a chilled weekend … went to see my sister on Saturday and yesterday, spent pretty much the whole day reading the New York Times and drinking coffee. Kind of worn out from spending a day with my 4-year-old neice, then listening to Woody Durham and the Carolina-Duke game that night (Go Heels). Returned to the novel again with a fresh mind on Friday and that is the work ahead. I am still tinkering with my characters’ names but have more plot in place than I realized. This week I will complete the section on Finding Jack Kerouac in New York city and the Mythical Scroll. Today’s post takes us back to where it began, to the mythical scroll. The 120-foot long manuscript of “On the Road,” completed in April 1951, published in 1957. Its success changed the life of Jack Kerouac forever and in some ways, took away the very freedoms and spontaneous road life he loved so much. No longer could he migrate around the country and to Mexico without recognition. Nowhere is this longing so beautifully described as in the Big Glorious Trip to Europe, described in Lonesome Traveler. 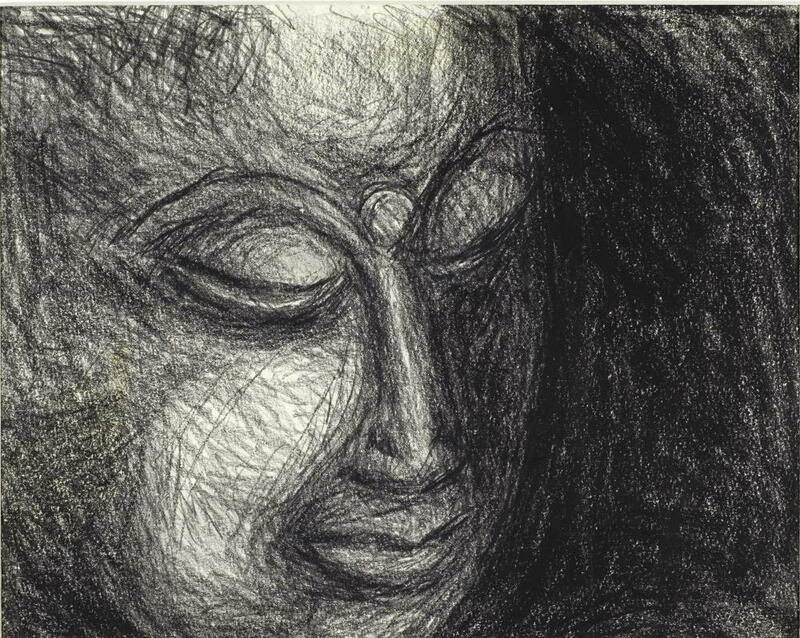 Other of his works that command reading are Big Sur, which to my mind captures the beginning of the dark end days, when he contends with and ultimately loses the struggle with his own nature, out of control; and also Satori in Paris, written in 1966 just before his death. It takes Kerouac to the places he considers his origins in France, and gives a last glimpse of the soul-searching brilliance that distinguishes his writing. Today’s entry ends with that famous quote from “On the Road,” words that have not lost their force, even after five decades. The only people for me are the mad ones, the ones who are mad to live, mad to talk, mad to be saved, desirous of everything at the same time, the ones who never yawn or say a commonplace thing, but burn, burn, burn, like fabulous yellow Roman candles exploding like spiders across the stars, and in the middle, you see the blue center-light pop, and everybody goes ahh…. ABOVE: Jack Kerouac. Private Ms. of Gone on the Road. 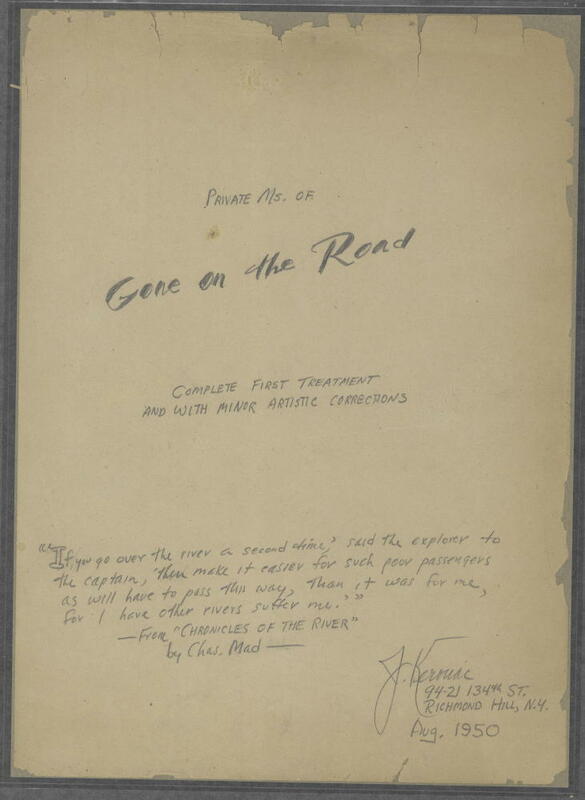 Title page of an early version of On the Road, August–September 16, 1950. New York Public Library, Berg Collection, Jack Kerouac Archive. Reproduced courtesy of John G. Sampas, legal representative of the estates of Jack and Stella Kerouac.